Yogurt is a nutritional powerhouse with minerals such as calcium, magnesium, and a rich source of protein. Nowadays, it is even touted to be one of the best foods for weight loss. Learn 5 health benefits of yogurt. Many would agree that yogurt is undeniably one of the tastiest dairy products ever! It's thick and sour cream with a mouth-watering smooth texture can compel most of the individuals to grab a spoon and indulge in it. However, out of many factors, what makes this dessert an amazing treat is its nutritional value and the number of health benefits it offers. Boosts immunity: Yogurt has good bacteria, also called probiotics, which help the body fight the bad bacteria, infections and pathogens. Since these probiotics aid in the release of infection-fighting white blood cells, they help boost immunity. While buying a packaged yogurt, always look for the words ‘live and active cultures’, which indicates that the yogurt has the goodness of probiotics. Improves digestion: The good bacteria in yogurt also help improve digestion. It can play a positive role in helping suppress various symptoms related to the digestive system including bloating, diarrhea, irritable bowel symptoms, abdominal pain, gas, constipation, inflammatory bowel disease, and many more. Individuals suffering from any of these diseases can get instant relief by eating a bowl of yogurt. Probiotics in this dairy product are also known to lower bad cholesterol and hence are heart-friendly as well. Prevents osteoporosis: Yogurt is a rich source of calcium and vitamin D and so is beneficial for the bones. According to the National Osteoporosis Foundation, calcium and vitamin D are essential for reducing the risk of osteoporosis. It is a bone-weakening disease that often affects post-menopausal women, leading to bone fractures. As per the National Institutes of Health’s Office of Dietary Supplements, one 8-ounce cup of yogurt supplies 415 milligrams of calcium, which is 42% of the Daily Value. Reduces the risk of high blood pressure: Alvaro Alonso, a researcher in the Department of Epidemiology at the Harvard School of Public Health observed a 50% reduction in the risk of developing high blood pressure among people eating 2-3 servings (or more) of low-fat dairy products a day, compared to those without any such intake. This crucial discovery emphasized on yet another important health benefit of yogurt. Weight loss: Yogurt is a rich source of protein. Since protein-rich food uses more energy to digest, the body has to burn more calories to release energy for the body, which in turn helps prevent any weight gain. Also, yogurt can help achieve satiety soon and therefore prevents one from bingeing on unhealthy foods. Though regular yogurt provides just 9 grams of proteins, a typical 6-ounce serving of Greek yogurt contains 15 to 20 grams of proteins. Now, that you know the major benefits of eating yogurt, you must add it to your daily diet chart. It can be used as a dressing on salad or as a side ingredient in many recipes. While plain yogurt is best, one can even try flavored yogurts found in the supermarket shelves. Van de Water, J., Keen, C. L., & Gershwin, M. E. (1999). The influence of chronic yogurt consumption on immunity. The Journal of nutrition, 129(7), 1492S-1495s. Sanders, M. E. (2008). Use of probiotics and yogurts in maintenance of health. Journal of clinical gastroenterology, 42, S71-S74. Kolars, J. C., Levitt, M. D., Aouji, M., & Savaiano, D. A. (1984). Yogurt—an autodigesting source of lactose. New England Journal of Medicine, 310(1), 1-3. Hekmat, S., & Reid, G. (2006). 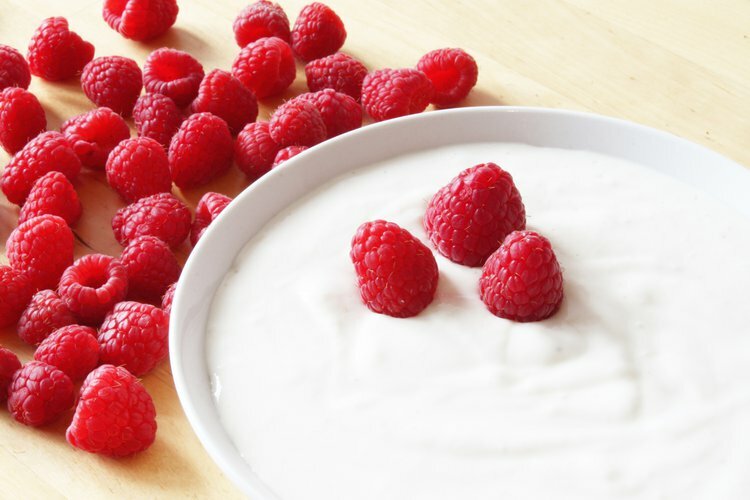 Sensory properties of probiotic yogurt is comparable to standard yogurt. Nutrition research, 26(4), 163-166.